While the majority of these machines are from series production, the company also customizes specialized machines according to clients’ needs. Over the years, Sennebogen has evolved in many aspects. Right from the time Erich Sennebogen, who was 21 years old then, set up the first plant in Pilling (before relocating to Straubing), it has had many significant milestones. First, the company is credited with being the developer of the world’s first fully hydraulic rope excavator in 1969. In the 1980s, Sennebogen set new standards, in terms of speed and efficiency, when it developed new designs of hydraulic systems (EVS three-circuit). In the years that followed, Sennebogen expanded its production facilities across the world. Besides this, the company also has a history of cooperation. In early 1990s Sennebogen partnered with Caterpillar to produce Cat-branded excavators. The deal saw Sennebogen produce over 1000 Cat-branded machines, most of which were excavators. This was part of a bigger joint venture between Caterpillar, Sennebogen, and two others (Eder and Zeppelin). The latter two later left the JV. In another cooperation agreement with German distributor Zeppelin, Sennebogen produced more than 7500 wheeled hydraulic excavators, mainly for the local market, between 1980 and 1996. And, between 1986 and 1990, Sennebogen produced crawlers and mobile excavators Hanomag. The products were entirely for export. According to Erich Sennebogen Jr, a senior executive of the company and son to founder, the company witnessed sharp growth between 1991 and 1997. In this period, the company closed down its plant at Straubing (it later open a large facility at Straubing-Sand industrial zone in 2008) and moved to a modern plant at Wackersdorf. This allowed the company set up new production lines as well as revamping its sales and distribution network. In 1996, Sennebogen launched a new product line - the scrap handling machines (the Green Line). At this time, the new line gave them leverage to compete with other established brands such as Fuchs and Liebherr. The positive reception of the product prompted the company to expand to North America. In 2000 Sennebogen establish a subsidiary in Charlotte, NC USA. Before long, Sennebogen LLC became a leading specialized equipment solutions provider in North America. Some of its most innovative solutions include log-handling, recycling and scrap metal yards, and barge and port operations. 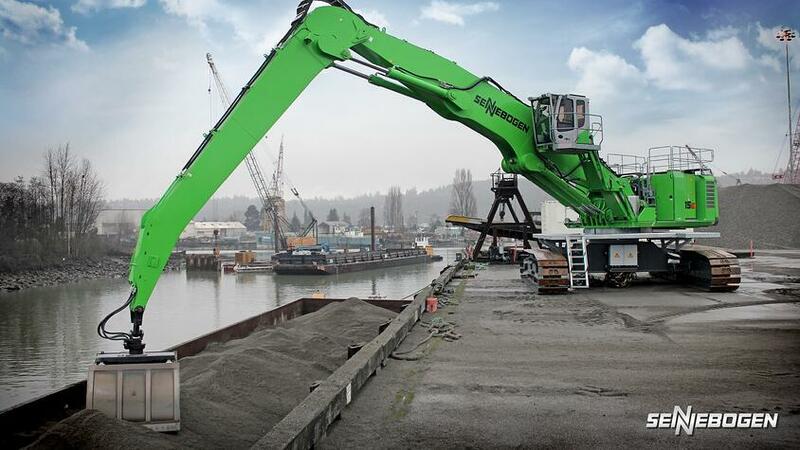 Through its growing list of distributors, Sennebogen LLC today, it is the go to expert in terms of material handling which also includes repairs, ongoing maintenance, parts and service support. Strong distributor network is one of the reasons Sennebogen LLC has had immense growth within a short time. Through Sennebogen Capital funding, the distributor network has offered financial support to help customer acquire Sennebogen equipment. In 2010, Sennebogen LLC supplied a new Sennebogen 880 EQ counterbalance crane to Midwest Generation. The later was launching a barge-unloading business at its Crawford Station. During the event, Erich Sennebogen Jr. together with a senior executive of Sennebogen LLC as well as a senior executive of a regional distributor Howell Tractor presented one of the largest material handlers in North America. The 220 tons 880 EQ enabled Midwest Generation to resume operations after a long break occasioned by breakage of its 50-year-old trailing tower crane. Prior to settling for the new technology from Sennebogen, Midwest Generation had, for a long time, been looking for a reliable solution. It had looked into different alternatives such as screw-type unloaders, hydraulic cranes and bucket unloaders. At last, the best solution was EQ 880, which was presented to them by Howell Tractor. So far, several customers in the USA region have come to trust Sennebogen machines because of versatility, power, and reliability. Recently, Stella-Jones Canada Inc. replaced their old machines with two 830MT D material handling machines at its Prince George pole processing plant. Through one of the Sennebogen dealers, Great West Equipment, Stella-Jones found a solution that boosted their operations than what they had experienced before. 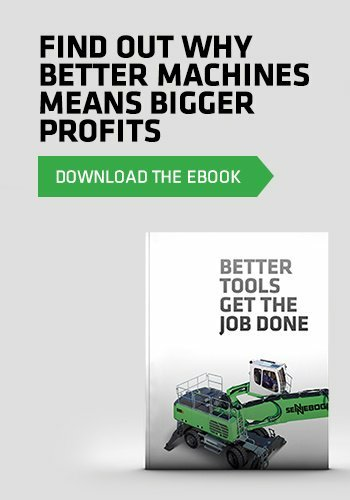 They needed user-friendly machines with the power to grab huge load with minimal damages. According to Robert Stewart, plant manager at Stella-Jones in Prince George, 830MT D has a wider wheelbase, can move easily even on soft grounds, and handles longer lengths of poles with same velvet touch and agility as short poles. Apart from Sennebogen LLC in Charlotte and several productions facilities in Germany, Sennebogen has other subsidiaries in Hungary and Singapore. It also has more than 120 dealers in various regions which include the Middle East, Asia/Oceania, Africa, America and Europe. In addition to this, the company boasts over 300 support centers in various parts of the world. The company is under the leadership of Erich Sennebogen Jr. and Walter Sennebogen. The younger generation of leaders is supported by a dedicated team of about 1200 staff who are stationed at different offices across the regions it covers. When Sennebogen is mentioned, you see a company with consistent growth (profitability, production capacity, and reach), stability, continuity, and pioneering spirit. Today, the group turnover is in excess of $400 million. Throughout the years, Sennebogen has consistently delivered the highest quality of products based on the newest technology. It has invested heavily in technology, research, and development to ensure this is achieved.